Google Chrome is a flexible and easy to use web browser. 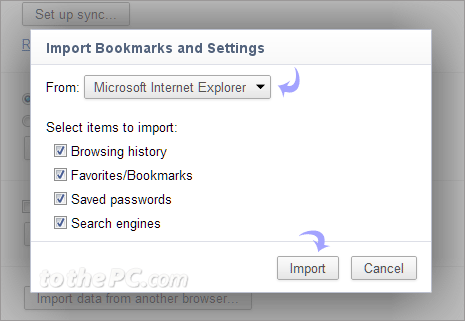 If you are making a switch from your current web browser (like Internet Explorer, Firefox, Opera) to Google Chrome: you can import and transfer settings, bookmarks, history and settings into Google Chrome browser. After importing data, you can browse internet in Chrome browser using familiar settings and bookmarks as used in previous web browser. 2. Click Wrench icon at top right and then click Options. 3. Then click Personal Stuff option on the left sidebar. 4. Now click Import data from another browser button. 5. In the pop-up box, select web browser option from the drop down box among: Firefox, Internet Explorer. 6. Also click to select, specific data that you want to import and transfer among: browsing history, favorites / bookmarks, saved passwords, search engines. 7. 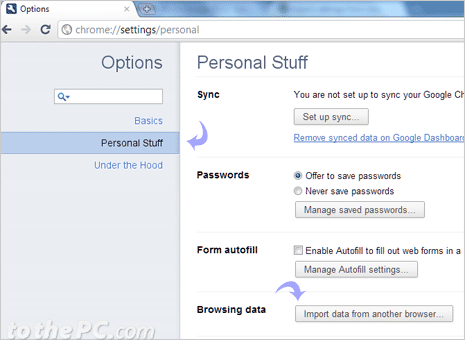 Click Import button to start the data import process into Google Chrome browser.